Anyone else as tired of winter as we are?! Tonight we are heating things up with a skinny recipe redo of one of our favorite summer BBQ foods, pulled pork with cole slaw. 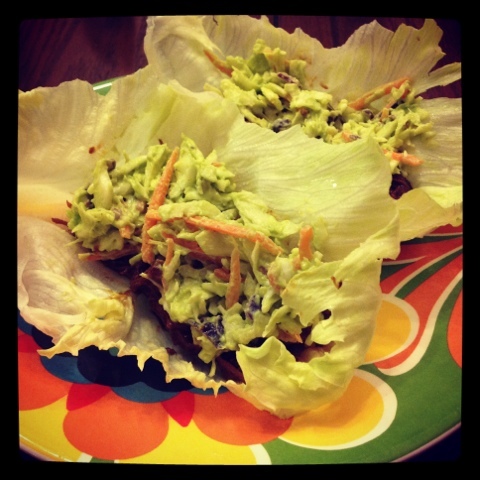 Our version uses lean chicken breast, avocado instead of mayo, and a crisp lettuce wrap instead of a heavy roll. Our BBQ Pulled Chicken with Avocado Slaw is so good we know it will become your new skinny barbecue staple! This one is SO easy too. We take a bit of help from the store here with store bought BBQ sauce (just be sure to double check the calorie count!) and a bag of cole slaw mix which is just cabbage and shredded carrots. This is the perfect meal to get all your favorite summer BBQ flavors but still get ready for summer bikini season ;) Hope you enjoy! 1. Start by boiling up your chicken breast for 15 minutes until cooked through. 2. Once chicken is cooked through, remove from water and shred using two forks. Mix in 1/2 cup of BBQ sauce and set aside. 3. In the food processor (or blender!) 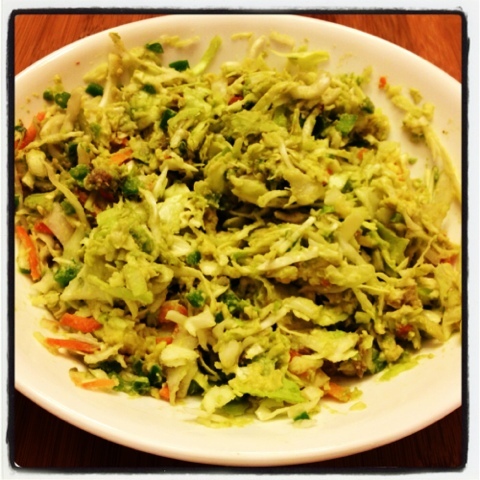 combine avocado, juice of lime, rice wine vinegar, garlic powder, salt & pepper to make your cole slaw dressing. 4. Mix dressing with bag of cole slaw. This sounds fantastic. Thanks for sharing this recipe.